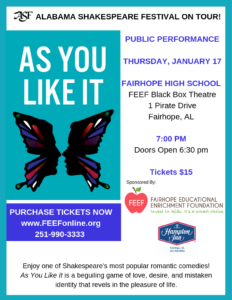 Fairhope Educational Enrichment Foundation (FEEF) will host Alabama Shakespeare Festival’s touring production of As You Like It for a one-night performance only on Thursday, January 17, 2019 at 7:00 p.m. in FEEF’s Black Box Theatre at Fairhope High School. This condensed version of As You Like It is sure to be a hit. This is one of Shakespeare’s most popular romantic comedies. It is a beguiling game of love, desire, and mistaken identity that revels in the pleasure of life. Proceeds from this public showing will help fund performances for more than 1,200 public school students in Baldwin County during the week of January 14. 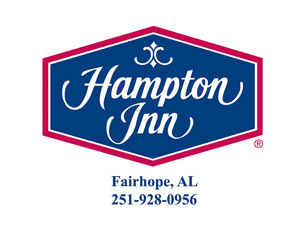 The production is underwritten by Hampton Inn Fairhope. This partnership with ASF is a win-win for all parties involved. The public has access to professional theatre at a discounted price, students are exposed to a first-rate Shakespeare performance, and ASF is able to reach an audience outside its traditional Montgomery location. General admission tickets are $15 and available by clicking here or by calling 990-3333. Ticket sales are limited and doors open at 6:30 p.m. for general seating.